Nuance Power PDF Standard is the easiest and most accurate way for demanding PDF users to gain control over PDF files. Create, edit and assemble documents that follow the new PDF 2.0 industry standard document format with the right features for searching, editing and sharing through your favorite cloud service. Power PDF is the next-generation PDF solution that supports touch-enabled Windows® 10 devices so you can be productive on the go or at your desk. 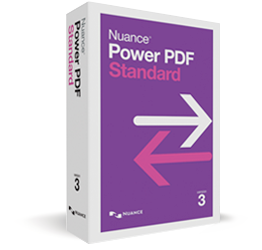 Nuance Power PDF Standard is the leading PDF solution for home and small office use that delivers ease of use and accuracy at an amazing value, freeing you from the compromises of traditional PDF software. Interface languages available within Power PDF Standard: English, German, French, Dutch, Italian, Spanish, Danish, Finnish, Norwegian, Swedish, Polish, Czech, Russian, Hungarian and Turkish. Create PDF files from any PC application that can print:Instantly create 100% industry-standard PDF files with security options that are fully compliant and compatible with all PDF viewers. You can even add bookmarks and transfer hyperlinks when creating PDF documents from Microsoft Word, Excel or PowerPoint. Archive important emails as PDFs:The textual, written content of an email can often be as important to your work as its attachments, if not more, so archiving them can be critical to your business. With Power PDF you can easily archive Microsoft Outlook emails and complete email folders as PDF files together with their attachments. Store the converted emails on your PC or document repositories and retrieve them when needed. Don’t retype your documents:If you must work with PDF documents in other applications, don’t waste valuable time recreating them – convert them. Complex layouts with columns, tables and graphics are accurately and faithfully reproduced in Microsoft® Word, Excel®, PowerPoint® and Corel® WordPerfect® documents. You also get exceptional spreadsheet control and features to allow you to combine all pages of a PDF document into a single Excel worksheet to eliminate tedious cutting and pasting. You can even select, copy and convert just the selected areas of text you need from a PDF document. Combine and assemble documents with ease:Combine files and remove or replace pages with drag and drop ease. View and select pages from a source document – such as Word, Excel, PowerPoint, WordPerfect, JPG, BMP, TIF or XPS – to insert into a target document. Just drag and drop the pages to add them into the PDF file, then swap or duplicate a page, or range of pages, when needed. Combine all open documents with one-click, and the original file names will become bookmarks in the new PDF. Use batch tools to automate repetitive tasks and improve efficiency throughout the workplace. Connect your documents to the Cloud:Now you can save and access your stored documents in the cloud by connecting directly to Box, Evernote, Google Drive or Microsoft OneDrive. This gives you access to your documents anytime, anywhere through the Web or by the applications of supported mobile devices. Collect information with forms: Don’t let the hassle of filling out long forms slow down your business. FormTyper™ automatically converts non-fillable forms into fillable PDF forms that you can complete, save and email. Create forms from scratch using easy-to-use form drawing tools. Export information in filled-in forms via email or web server so you can sort, search and analyse the data using popular database and spreadsheet file types such as XFDF, HTML, XML, TXT and CSV. Now featuring the ability to change the interface to the color that suits you best. Choose from blue, light grey, dark grey or the familiar purple. You may also now choose to view documents in separate tabs inside one Power PDF window, or to view each document in a separate Power PDF window. Microsoft .NET Framework 4.5. If it is not detected, it is installed with the product.